Having a good structure on your site makes it easier for readers to find your content. This is why WordPress offers categories and tags to properly organize your content. To learn more about them check out Categories vs Tags guide. As your site grow, you might find a need to change the name of your categories and/or merge them with other categories. In this article, we will show you how to properly rename categories in WordPress without affecting your SEO strategies. 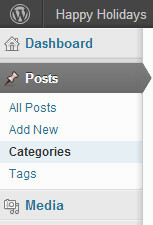 WordPress has a nice category management area, located at Posts » Categories. 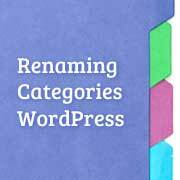 On this page you can manage WordPress categories, edit existing categories, and delete unwanted categories. There are two ways to rename categories, the Quick Edit way, which allows you to change a category name and slug quickly. With quick edit you can change category name and slug but if you want to add description to a category then you need to click on Edit. 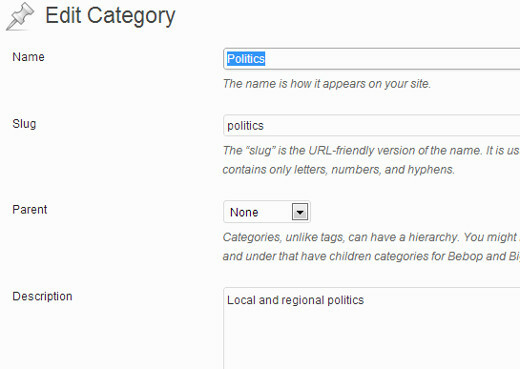 This will take you to category edit page where you can change a category name, slug and description. You can also choose a parent category on this page. You can also merge and bulk edit your categories and tags. By merging you can combine two or more categories into one. One thing that you might want to keep in mind is that changing a category slug will change the category URL. So if you are using that URL in your WordPress menu then the link in the menu will not update itself. You would need to manually update that link to the new category url. Once you have renamed your WordPress category, you will need to setup proper redirection for search engines and users. Use our tutorial on how to track 404 pages and redirect them in WordPress. This method allows you to redirect users coming from other sites as well as search engines to the correct category URL. 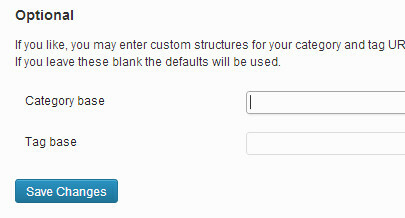 WordPress also allows you to change the /category/ prefix in category URLs. It is called category base. To change it go to Setttings » Permalinks and scroll down to Optional. There you will see a form to change category base and tag base. For example you can change http://www.example.com/category/your-category-slug/ to http://www.example.com/topics/your-category-slug/. Using right keywords in your category names can increase your site’s SEO rankings. It also allows users to easily navigate through your site’s content. How often do you visit category management area to rename categories or add category descriptions? Let us know in your comments below. Hi, I don’t have any option to delete or change the name of categories. When I go to My Site/Blogs, there’s nothing there that says categories. I’m using the free version of wordpress – would that make a difference? You are probably using WordPress.com which is a little different than self hosted WordPress.org websites. Please see our guide on the difference between self hosted WordPress.org vs free WordPress.com blog. On free WordPress.com blog you will need to go to the admin area for an individual blog and then you will be able to locate categories. Thanks for your quick response. I am using WordPress.com. I still can’t work out how to delete categories, or to change the names. My Site > Settings (about the 2nd to the last option at left side menu) > Writing tab > Categories > then click on the ellipsis at the righthand portion of the category you want to delete > Delete. It sounds like if I change any catagories, I won’t be able to let users and search engines know of change… WordPress doesn’t offer the redirection plugin??? Please see our guide on creating redirects in WordPress. What would be helpful is mentioning HOW you can replace all those links throughout the site instead of simply stating that you have to. As you mentioned in the video, your site grows. how come I do not see the same screen you show on the video? And when I click on post, it only allows me to add post, there is not edit or delete button for category. Missy, try the drop-down menu you get when you hover over ‘My Site’ on your blog’s home page. The thing you want from the drop-down menu is ‘WP Admin’ – this should take you to the pages that look like they do in the tutorial above. Hi, thanks for this helpful post. I’d like to ask, if I add a second category to a post (as opposed to just changing a post’s category) I’ve noticed that sometimes the post url will switch to that category slug, resulting in a 404 and lost likes/shares on social media. Is there any way that this can be avoided? You can use redirection plugin to set up a 301 redirect from old URL to the new. This will solve the 404 errors. Hi, many thanks for your reply. What I was hoping was to somehow figure out a way to keep the original category slug so as not to lose the social share count. For example if I have a post in “science” and want to add it to the “latest news” category as well, I’d like to stop the slug from changing to /latest-news/ from /science/ or at least be able to rewrite it if it does. Is there any way to do that? Thank you for the article it was great. Forced me to do some reorganizing, but I appreciate it. I am still searching for away to remove the “category” base from my permalinks. I would like to do it without a plug-in if possible. The plugin that I did find with the best reviews hasn’t been updated in 2 years. Options such as adding “.” or “/” are not working for me. @Jeremy, I do not knoe if you still need this or you found it already or you still need it, you can use this plugin (Remove Category URL) for it. Are you trying to rename the taxonomy category into topic or you are renaming an individual category term? When I rename category to topic,generated sitemap still contain category(not topic). Is there any ways to fix this? See how to merge and bulk edit categories and tags in WordPress. See our guide on how to bulk edit and merge taxonomies in WordPress. How about properly renaming ‘categories’ itself, to something like ‘topics’? Where do you want it renamed? To change that general label in the presentation of the ‘blog to a visitor (as such), one would edit the theme, or create a child theme with the relevant edit. That editing itself would not be done through the dashboard (though selection of a child theme would). To change the general label of what are called “categories” in the dashboard might make sense if you have multiple contributors or if it really disturbs a single contributor. I’ve never had a felt need for such a change, but one could hack the PHP, or install one of the plugin tools for editing the dashboard. My question is this…if I change the category names and my blogs are categorized to the old names, will my blogs be redirected to the new names automatically or do I need to go to each blog and and re-categorize them? If you are using the redirection plugin, then it does the redirection part for you. Thanks so much! I was puzzling over how to do this very thing. I am new to blogging and having a great time; this entire realm is making my brain work and I love it. In my next life I want to learn to write code. If you are toodling around the web and want something to read, I would be honored if you peeked at my site, and welcome any input. I use a pen name. Thanks for all this info! Thanks for this; I’ve finally built up enough content that I need to seriously consider organizing. I couldn’t figure out how to merge categories, and didn’t realize their importance for SEO.